Home > Posts tagged "partnership"
One of the central themes of the new book – How to Run a College: A Practical Guide for Trustees, Faculty, Administrators, and Policymakers — that my co-author, Dr. W. Joseph King, and I touch upon repeatedly is that American colleges and universities operate with an unsustainable financial model. It is no longer possible to match expenses with incoming revenue by setting a college’s annual comprehensive fee (tuition, room, board, and fees) to meet its obligations. That approach began to weaken when colleges started to discount their tuition, with discounts at a good number of schools now over 70 percent of the tuition sticker price. Consumers confuse and often conflate sticker price and cost and are unwilling to pay a number that they do not fully understand. Additionally, much of the housing fee now directly supports the academic program, as fully depreciated, aging residence halls become desperately needed cash cows. Fundraising provides limited short-term relief, except for what can be raised largely through the annual fund. And at most public and private colleges and universities, the drawdown from meager endowments cannot provide a steady cash base upon which to run the enterprise. Further, at all but a handful of research universities, government grants and contracts do not substantially support an increasingly vulnerable house of cards. After creating whatever efficiencies exist in discretionary spending, most higher education institutions are at a loss in their search for new revenue. Rushing to offer more adult, continuing education and online programs is a risky business plan. At many colleges and universities, the most valuable asset they may hold is the real estate on which the campus sits. In Boston, the merger between Wheelock College and Boston University (which resulted in the closure of Wheelock) and the takeover by UMass of Mount Ida College were notable for the value of their real estate. While there may not be a single calamitous “day the dinosaurs died” moment, these examples suggest, at a minimum, that real estate can often be an undervalued asset, especially in mergers, acquisitions, and closings. There’s an open question as we move further into the 21st century on whether colleges and universities must own all of their real estate. Is it possible, for example, that a college’s stakeholders, legal team, accountants, and student life staff could work together to negotiate the sale of residence facilities while still maintaining a metric-driven control over its student life programs? Fundamentally, it means shifting how senior administrators evaluate staff – especially student life staff. Is it the number of beds served or the quality of the programs offered – supported by metrics like retention and graduation rates – that determines the importance and effectiveness of a student life program? Should it stop with residence halls? Likely not, particularly if shared athletic, conference, and performance facilities could be co-developed with the taxing jurisdictions in which they are operated. In the last century, higher education was an accepted public good because it saved taxpayers money and therefore qualified for tax exemption. No one thought much about that tax exemption until cash-strapped cities and towns moved to tax colleges or demand payment-in-lieu-of taxes (PILOTs). In this century, it is likely that an institution will need to show additionally that it performs a tangible public good. Most tax payers do not appreciate that colleges often compensate taxing jurisdictions for police and fire support. They would understand better perhaps if colleges and universities used their position as economic engines in their region to improve common use facilities and support economic and commercial development. Since curb appeal figures prominently in any institution’s marketing, enrollment, alumni, development, and branding efforts, it makes sense to support the neighborhood beyond the college walls. It’s time, in fact, to demolish these walls to integrate each college into its region. But colleges and universities are not in the business of urban planning and are only now thinking more broadly about how to work through community real estate partnerships. The problem is that administrators, whose knowledge in a complex collegiate governance and management environment may run broad but not deep, don’t always know where to begin. The best source available seems to be the new Higher Ed P3 (public/private partnership) Resource Center sponsored by the advisory and program management firm, Brailsford & Dunlavey (www.p3resourcecenter.com). It’s easily accessed on the web and contains a series of thoughtful “P3 101” articles, articles written by professionals in the field, original research, videos, and infographics that lay out the fundamentals of how and even whether to launch a strategic partnership with government and private developers. That’s important because making a series of bad first moves likely forecasts a failed relationship from which a college or university might not recover. Colleges and universities that understand the value of an underperforming asset like their real estate should first grasp how to manage the question of why consider using real estate to further an institution’s goals. Facilities staffs, however well intended, typically do not have the in-house expertise to move this agenda. Colleges are very conservative places and should be keenly aware of what they do not know. It takes a village of committed college stakeholders to rev up the economic engine that a college represents when its resources are used efficiently. As we note in How to Run a College, those colleges and universities that become more sustainable will do so because they were careful but agile stewards of their resources. Cutting through campus inertia, it is time to build a future that relies less on tuition and debt. How Should Americans Pay for College? As reported last week by Ashley A. Smith in Inside Higher Education, one of the most interesting developments in higher education is how the growing concern over high tuition sticker prices is playing out in state and national politics. Much of the discussion is a good-hearted effort to make college more affordable, especially for middle class students and their families. These efforts are noble and the cause is just. Free College Tuition: A New Entitlement for the Middle Class? There is also some hint, especially at the state level, that programs that address high tuition sticker prices do well in polling, especially for candidates with broader national political ambition. These programs leverage the ability to redeploy state budgets, or seek new revenue, to craft a new middle class entitlement. While the approach may vary, these programs seek tuition relief. Referred to generally as “college promise” programs, they are tuition-free initiatives for community colleges, and in some places, four-year public colleges. They have been rising in popularity across the United States. The “college promise” programs raise an important question in American society: Should a college education that is increasingly an entry–level expectation for millions seeking full-time employment be a right or an expectation? It’s against this backdrop that the non-partisan College Promise Campaign launched by President Obama and the Educational Testing Service recently released reports exploring what they thought were five promising models. The first approach supports payment by combining children’s savings accounts with a college promise model. The goal is to offer an option to increasing debt, expanding college access to families who are loan adverse or beset by rising debt before they graduate. In this model, the City of Oakland has already raised $25 million of their $35 million goal to support multi-year scholarships to supplement the children’s savings accounts. The second model may be the best known among the group, pioneered already in states like Tennessee and New York. The financial backing comes from strategies like tax credits, tax increment financing, outside philanthropy, and lottery revenues. Its impact, especially in New York, which has the largest number of private colleges in the nation, can be dramatic and deleterious to private colleges, particularly in states where the public-private mix is more balanced in favor of them. A third model uses philanthropy and public-private partnerships to raise support for college promise programs. It can be stand-alone, using individual donors or corporate support, or can be backed by a public-private mix, like the Michigan Promise Zones. In this case, Michigan uses an increase in the state’s education tax to mix with private donations. The fourth approach calls for the use of outcomes-based models in which the student might receive a $10,000 scholarship but must pay it back through a deduction in future earnings. If a student earns less under this income-sharing agreement, then the student may end up paying less than the $10,000. Purdue University’s “Back a Boiler” program is a good example. The final model examines the role of the federal government, especially after President Obama’s proposal that would have made two years of community college free nationally with states partnering on the tuition bill. The authors of this report think that the federal approach should not pick winners and losers but should help states stabilize state support for colleges and students by incentivizing them. There’s much to commend here. There is a predisposition in the report findings to argue that the federal government should not manage a centralized program that would increase bureaucracy at the federal level. There is a recognition that the best solution might be different in each state, depending upon the mix of colleges and universities, level of tuition paid, and the workforce needs in the region. And perhaps most significantly, there is an appreciation for higher education as a public good. The report findings suggest that education is a right and not a privilege. It’s a fundamental debate that must be settled in an era in which the expansion of entitlement programs is unlikely. Yet at the same time, its authors agree that support for higher education must be a shared responsibility among many players. This better suits the national fiscal climate. What is less clear is that one of the partners within shared responsibility must be the student and their families. For this to work, all participants must have skin in the game to the extent to which they are able. There is a political truce that will also need to be worked out among the various higher education sectors. This begins with an appreciation of the contributions that each group, including private higher education, by educating the public and serving as a critical economic engine in many states. It will also mean that the role of each sector, including the value proposition for community colleges for instance, must be understood to better justify state support for access and choice. Without defining the purpose and outcomes across the state and federal government programs that support higher education, it is unlikely that a coherent and seamless higher education pathway can develop. But the models described show great promise. And that’s a good news story. The first indications are in on how the academic year is likely to go. In the pomp and ceremony that surrounds the opening of the school year, deep concerns emerge behind-the-scenes in all but the best endowed institutions as the numbers come in. There are no alternative facts to hide what an institution will face. It’s the “is what it is” moment for America’s higher education. Colleges and universities have known what the composition of their incoming classes will be since last May when a fairly complete freshman profile emerged. They completed summer renovations on facilities and monitored their multi-year building projects. And they have matched their staff, especially faculty, to the size and needs of the incoming and returning student bodies to keep their student/teacher ratios in line. What was the summer melt — those who intend to enroll but don’t arrive — of students like? Did the freshman class meet the enrollment projections? Did the Office of Financial Aid meet or exceed its budget? What will federal and state support look like, especially at public institutions? Were capital projects delivered on time and on budget? Since most colleges are so heavily tuition-dependent, these financial questions increasingly dominate senior leadership discussions each fall. The cold facts are that colleges are capital-, technology-, and labor-intensive institutions. There is very little discretion available to them in an annual budget. And the numbers will likely confirm soon that net tuition revenue is essentially flat for yet another year. Further, many of them, including some very good schools, did not meet their internal enrollment projections. The financial model at tuition-dependent colleges and universities that support their people, programs, and facilities no longer works. Clearly, higher education is going through a process in which it must reevaluate how to pay the bills. There are ways to put the financial pieces together differently, drive efficiencies and cost savings, and look to outside partnerships to reevaluate how to make the educational enterprise work without destroying the historical foundation upon which colleges and universities are built. One example is the Taj Mahal residence hall. These are often spectacular facilities with amenities that exceed anything that most students – even those sharing apartment rents – will be able to afford after graduation. The “build it and they will come” theory of facilities design and enhancements has serious drawbacks. Its presence draws attention to the inadequacy of the current financial model. These residence halls symbolize the excesses of American higher education, especially the failure of a college to live within the means that would dampen tuition sticker price increases. The facts are that it is unlikely that higher education institutions need to put so much cash into development of these student residential palaces. If they do, private developers should bear the cost of their construction, assuming that they can maintain quality and create efficiencies that a college is unable to do using in-house expertise to moderate the cost. In fact, in many cases colleges should be moving out of the student “hotel” business, using a progressive redesign of their student life program to achieve broader institutional strategic objectives that go beyond these luxurious student residences. Colleges must also find a way to diminish the need both to treat fully depreciated student housing as a cash cow to shore up their general programming and re-capture much of their upper division students for whom they may not currently provide housing. There are larger questions drawn from these trends. When is more just more? And, what do students actually need? Let’s assume that students need a residence that has decent square footage and is well-maintained. They should be clean, have adequate electrical capacity for their growing number of technology-related products, quiet HVAC for heating and air conditioning, and private or semi-private bathrooms, depending on the configuration of the facility. That’s enough. They do not need in-house pools, exercise facilities, cafes, or in-suite laundry facilities. That’s too much. In fact, if a college or university thinks strategically about what tops the list of students needs, they are likely to hear that it is technology – and specifically, connectivity. 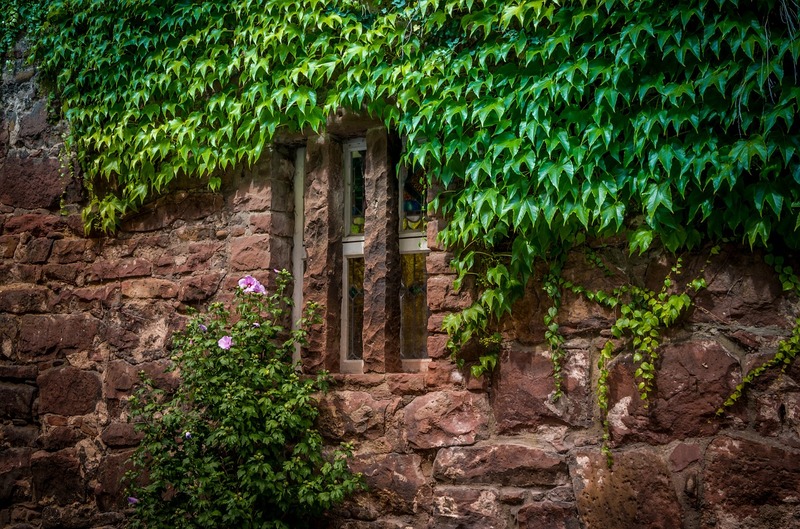 The ability to connect to the outside world is the great leveler for colleges and universities that break down the geographic, social, and cultural barriers that all institutions face in different ways. This is an area of continuing concern on college campuses. It is a particularly serious problem on rural campus where social and cultural options are more limited. Technology is a large, recurring expense for most colleges, especially since demands shift and technology changes with amazing speed. The solution will require new and imaginative partnerships among colleges, business and industry and their providers. It may be that fewer dollars – or perhaps more private partnership dollars – can be put into non-core, non-academic facilities like residence halls to pay for other expenses like technology. Whatever the solution, colleges must think strategically by looking to the consumer demands of their students and less to the mindless “rock wall” amenities of their competitors. As the Ivy League Goes…So Goes American Higher Education? Brandon Busteed, the executive director for education and workforce development at Gallup, wrote a stimulating and thought provoking op ed earlier this month. The article’s title captured Busteed’s summary opinion: It’s Time for Elite Universities to Lead in Non-Elite Ways. Citing the Wall Street Journal, Mr. Busteed reports that these trends caused 30 years of unprecedented growth in tuition rising “more than 400 % since the early 1980s and far outpac(ing) the cost increases of all other goods and services during the same time frame.” Busteed concludes, rightly so, that the pace is unsustainable. First, Mr. Busteed is right to infer that America’s colleges and universities are often places of cultural inertia. On most college campuses, process overrides other considerations. Shared governance among trustees, staff, and faculty often produces thoughtful change. But change can move at a snail’s pace, especially at the handful of well-heeled elite colleges and universities relatively unconstrained by financial, political, or cultural pressures. It’s a kind of “rule by committee” at times in which winning the debate can be as important as settling on the policy direction. The process can look more like the production of sausage even if the end result is appealing. Second, change is hard. But the advocates for change face unique and idiosyncratic differences on every campus. Rather than argue that less wealthy colleges follow the elites, it may be just the opposite. Under-endowed colleges and universities are the most willing to make change. Simply put, they have no choice. These institutions are tuition-dependent and their survival requires some mix of planning, gambling, and luck. American higher education is not a monolithic pecking order in which the less fortunate emulate the wealthy. Those days ended in the last century when financial aid discounting disrupted archaic financial planning models to produce the current financial crisis in higher education. Third, American higher education is highly decentralized. Expanding graduate and professional degree programs means very different things at a major research university compared to a rural, four-year liberal arts college. Further, colleges identify what they do and what programs they offer by their mission and purpose. Each category – indeed, every college and university – has a different purpose. Not all of them train America’s workforce in the same way or contribute to local and regional economic development in lock step. Fourth, it is wrong to assert that colleges and universities are failing to build active community partnerships. In fact, most of America’s colleges and universities are eager and integrated community participants, deeply involved in basic education locally, and active in promoting regional, social, cultural, and economic initiatives. Where would West Philadelphia be, for example, without the decades-long work of the University of Pennsylvania and Drexel University in their local community? There are hundreds of these examples across America. That’s not to say that America’s colleges and universities must not evolve to match their programs to develop the workforce and assist in economic development based on the pressing needs their regions face. In fact, the mission and purpose of any institution must always reflect the society that surrounds it. Yet these institutions must also help set the agenda for where society will head. It’s not enough to follow the trends sanctioned by the actions of elite institutions. It’s critical to have the courage to lead locally based on what challenges face them at home. To do so, America’s colleges and universities must plan individually and act collectively. Higher education is not a monolithic industry with a defined and inflexible pecking order but a collection of decentralized colleges and universities – large and small – that reflect the genius, strengths, and pitfalls of 400 years of history. America’s colleges must find new ways — and new words — to describe their importance and differentiate more sharply their contributions to society. But the pronouncements and policies of a handful of elite colleges and universities is only one place among many from which the majority of higher education’s institutions can find and refine their future. In a surprise move last week, Purdue University announced its intention to acquire for-profit Kaplan University. If approved, Purdue will become a major player in online education. 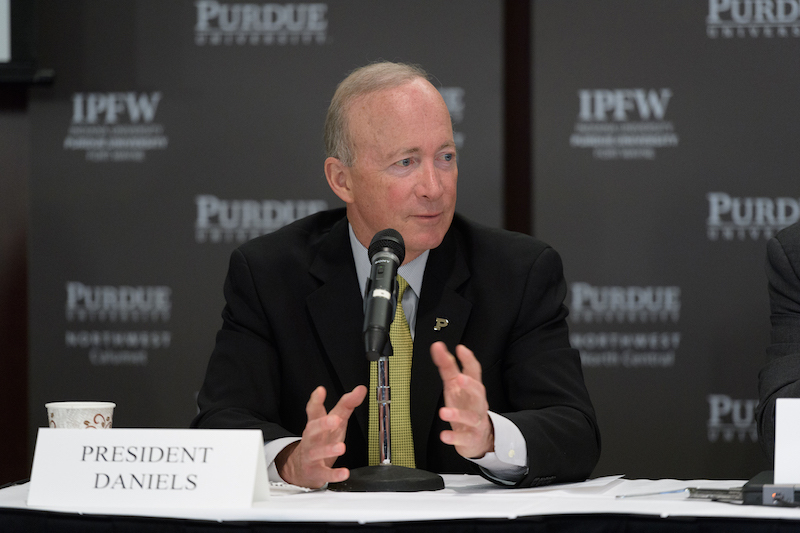 Its president, former Indiana Governor Mitch Daniels, described the takeover as a “third dimension” to Purdue, adding Kaplan to its research flagship and regional campuses. Mr. Daniels argued that before the acquisition Purdue had little presence in online education and had “basically been a spectator to this growth.” Kaplan University has 32,000 registered students, but enrollment has been falling for several years. Kaplan’s students are heavily skewed toward military veterans, lower-income students, and members of minority groups, including first generation college students. Their average age is 34, a sharp contrast with the 20-year old average age at Purdue. The deal has a number of parts. For Kaplan the deal offers a profitable way out of a battered reputation and declining enrollments. For Purdue, the deal may be a game changer if the right puzzle pieces fall into place. Purdue’s total enrollment will grow from 30,000 to 70,000, with 30,000 registered online. The new online initiative will receive no state funds and rely solely on tuition and donations for support. Under the terms of the deal, which would create a new public university, Kaplan students, academic programs, 15 campuses and learning centers, and academic staff of about 3,000 will become part of Purdue. Kaplan, Inc., the parent company (a part of Graham Holdings that for decades owned the Washington Post), will continue to provide the technology, marketing, admissions, and financial aid, as well as other back-office operations. In return, Purdue will pay Kaplan 12.5 percent of the online program’s revenue, but only after Purdue and Kaplan have both recovered their direct costs. The deal could stretch 30 years. Purdue will also be guaranteed a minimum of $10 million annually by Kaplan before Kaplan is reimbursed for its direct costs or receives 12.5% of any additional revenue. Kaplan will no longer be subject to the “gainful employment regulation,” that scrutinizes career-focused programs that load debt on to students relative to the income that they will earn. Many independent analysts suggest that the deal makes sense, although the move also has its critics. For Purdue, the structured deal permits the University to move quickly and efficiently into online education without developing the technology, staffing, marketing, and enrollment start-up costs that it would otherwise incur. It will now compete at a scale and in the same market as other large non-profit online education programs like Penn State. The deal will also improve the national and global reach of a major research university that is best known for its highly regarded science and engineering programs. Purdue will need to undergo a series of regulatory, accreditation, and internal administrative hoops before the new arrangement takes hold. Mr. Daniels estimates that this process might take several months. The move by Purdue will be watched carefully across higher education. It represents a startling realignment of the for-profit and non-profit community, in which one of the lead players has an established reputation, but is weighted down by the baggage attached to the highly public criticism of large for-profit educational providers. On the other side, Purdue’s president is perceived as a maverick change agent whose approach may not be received well by Purdue’s faculty who were not part of the acquisition discussions. Is Purdue-Kaplan Deal the Higher Ed Partnership of the Future? Beyond the internal dynamics, there are a series of important policy questions to address. If we accept the premise that higher education will evolve at a faster pace because of the accumulated pressures – especially on revenue – that its institutions face, is it likely that the Purdue/Kaplan arrangement is an outlier or instead a prediction of the kind of tectonic changes higher education is likely to face? In this respect, Purdue provides an interesting case study. What is most intriguing about Mr. Daniel’s approach is that he understands that sustainable growth in the University’s future could not be built off tuition, state appropriations, and debt. Purdue is a research university but also a state institution committed to educating Indiana’s citizens. It must think strategically in a league in which other large research universities play. As such, this is a follow-the-money moment in which the Purdue brand goes global and the financial underpinnings of what Kaplan will provide pay for the move to online education. Done correctly, the new arrangement will likely improve Purdue’s competitive standing among its peers. If the test fails, then Purdue will become the poster child for why non-profits and for-profits can’t mix. Despite the uncertainty, Purdue earns an “A” for the effort it has made to move strategically by searching for new resources under new terms and through new arrangements to meet its strategic goals. It left the old understandings and financial foundation for the flagship and branch campuses untouched. Now, we’ll watch to see if big chess moves can match ambition to reality.